Welcome everyone to my 3rd Blog Anniversary Give Away. I "met" Carolyn Westbrook about 4 years ago, when I discovered her first book Carolyn Westbrook Home, and fell in love with her wonderful plantation home and gracious southern style. 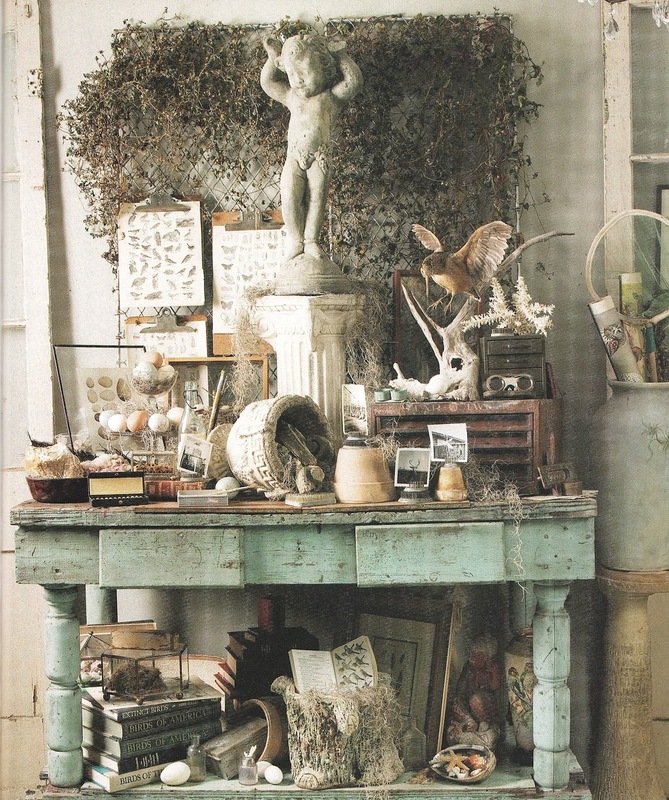 Her books are filled with inspiringly beautiful rooms and outdoor spaces that evoke her signature design look. Many of you know her from the Spring and Fall Texas Shows, and have loved her work for years. She has been such an inspiration to me personally, as I've re-decorated my home in the last several years. 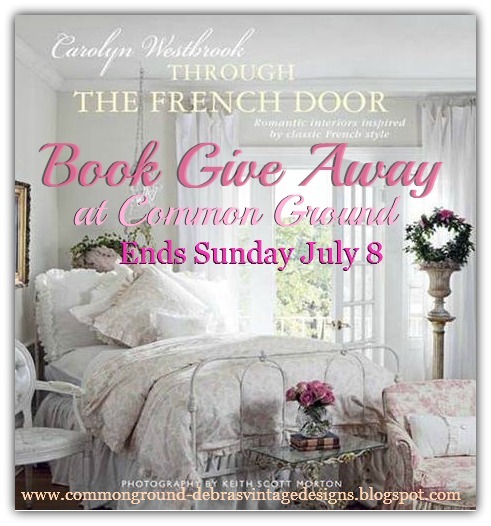 Last year for my 2nd Blog Anniversary, I did a Give Away of Carolyn Westbrook's latest book, The French Inspired Home. So this year when I knew that she had a new book in process I contacted her about another give away, and this book looks just as amazing as her last! which will be released in October of this year by CICO Publishing. "Once again, I would like to welcome you back to the plantation that we call home. It is always a work in progress and is ever-changing, just like me. Always evolving through time and where my passion lies. I think back to my childhood, how our house would move through seasons and time, and whatever my mother was passionate about at the time, was always reflected in our home's interior. Whether it was modern and sleek or an Asian themed interior this is where she felt comfortable or what she considered beautiful. Of course, there were and still are with me, the things that you love the most and you simply cannot part with and should never have to. These are the base of your design plan and then you can build your room around these things." 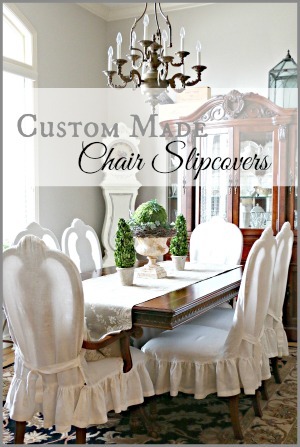 "There is much more to creating a home than going to a furniture store and randomly choosing a packaged room. As I always say, your home should tell the story of those who dwell there. Everyone has a story that tells of their own journey through life. Your home should speak out about where you have been, who is dear to you, and those special trinkets and trappings that you have picked up along the way. Many of you are facing a blank canvas. 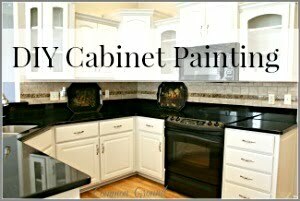 For some, that can seem a daunting task with all of the white walls and empty spaces that need to be filled. When faced with a large space, it is often a good idea to break it down into smaller little vignettes, that seem to warm up the room and make it more comfortable. A seating area of random French chairs, benches, and gorgeous stacked oil paintings and collections that layer a big wall space to make it breathtaking and interesting, all at the same time, and most importantly, telling your story." 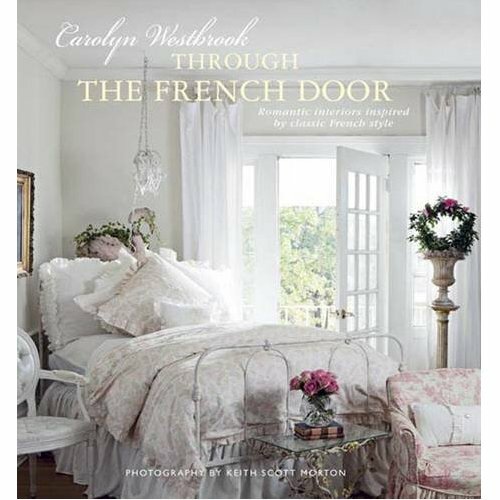 Carolyn Westbrook from "Through the French Door"
So now, here comes the fun! Please be a follower of this blog, Common Ground, and let me know in a comment. 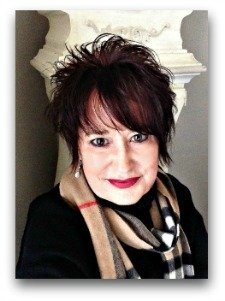 Visit Carolyn Westbrook on Facebook and "Like" her there. please leave a comment on this post. Share the Give Away on your Blog and/or Facebook page and let me know in a comment(s). Grab the large image on the sidebar if you'd like. I didn't do a button, but it will shrink down for your individual sidebar size. Thanks for sharing the Give Away fun, I really appreciate it!! You have 4(or5) chances to win one of three books! Yay!! Because the book will not be released until October, it will not get to your little hands until then, but don't worry, I won't forget you! I'm a follower. Carolyn Westbrook's book looks beautiful and dreamy! I'm a follower. I thought I already was because I've followed you on Pinterest for some time. sent a friend request on Carolyn's FB page. I am already a follower and so nice to know that bedding will be at Dillard's next year. Just wish it was now! I am a follower! thanks for the opportunity! I have one of her books and I just love it. I am definitely a follower. These books look fantastic. I would love them. I am already a follower of your beautiful blog.. Updated my FB status sharing your blog and the giveaway! I'm back and you know I'm a follower! What a beautiful book giveaway! I like Carolyn Westbrook on FB! I'm putting the giveaway on my blog! and in a few minutes will check FB. I think I like you already!! Actually, I love you! I look forward to seeing you for Potpourri Friday! As you already know...I'm a happy follower:) This book looks like it's going to be wonderful...going over for a visit at her place. Thank you for this chance to win, Debra! I loved Carolyn's last book and this one looks just as yummy. 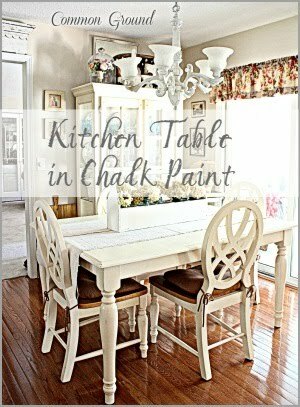 Shared your giveaway on my facebok page...Coastal Charm. Hi! Did everything you wanted. Would love to win the book. Thanks!! Just signed up to have your blog delivered by email! I can't believe that I am just now finding you! Love, love Carolyn Westbrook! Her beautiful images always makes my heart skip a beat! 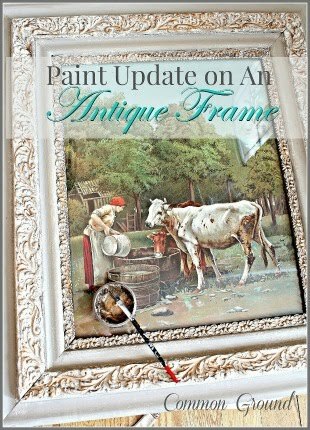 Getting ready to move from Alabama to a new home in SW Missouri, this book would provide lots of inspiration for new decorating ideas! Hello dear Debra... I would love a chance to win that fabulous book!... I do not do facebook, but I have been your faithful follower from the beginning!... it looks so beautiful!... xoxo Julie Marie PS I started my blog in June of 2009 too... and you were one of MY very first followers as well... gee, we've been though alot together!!! I shared your post on my FB page. (I'm fairly clueless about FB myself.) Jo @ Let's Face the Music. Hi Debra, its been far to long in between visits, I can see that I have missed way to much. This is a beautiful GiveAway and I am sure the winner will be so inspired with its beauty page after page. See you soon Debra and all the beuty you bring to blogging. Just shared on our FB page, and "liked" Carolyn's FB page! I liked Carolyn on her facebook. Following your blog. Rustique Market sent me and I love it and shared on my FB page! I like your blog I visited carolyn's page and liked her . shared your giveaway on my FB page. follow you on pinterest. Absolutely love it!!! I've got this book on my Amazon Wish List, Debra, so I'd love a chance to win it. I am a long time follower! I've put the giveaway on my blog sidebar, Debra! I liked Carolyn on FB. Debra~Love your blog!Iam now following it!Thanks! Hi, I am a follower and have been for a bit. Greetings to you and thanks for this opportunity again! Hi Debra, just a note to let you know that I'm already a follower of your blog. Also went over to FB and liked Carolyn. Already like you on FB and follow your pins. This would be a. Lovely book to have! Going to post about iyour giveaway tomorrow on my blog. - Debbie O. Count me in this fabulous giveaway! You know I've been a follower since way back, girl! Thanks for the opportunity to win something so fabulous. Already a follower, the book is lovely, would love to win it! I'm already a follower, Debra. Love the look of the book! What a gorgeous book! I am already a follower of your wonderful blog, please enter me:) Merci! Debra, I really like your blog and have started following you. I would love for you to vist me at My Dream Canvas. Have a lovely day! I liked Carolyn on Facebook. How wonderful! I would be thrilled to have this fabulous book. I'm a follower and you are in my favs! Thanks! Oh, sign me up please! 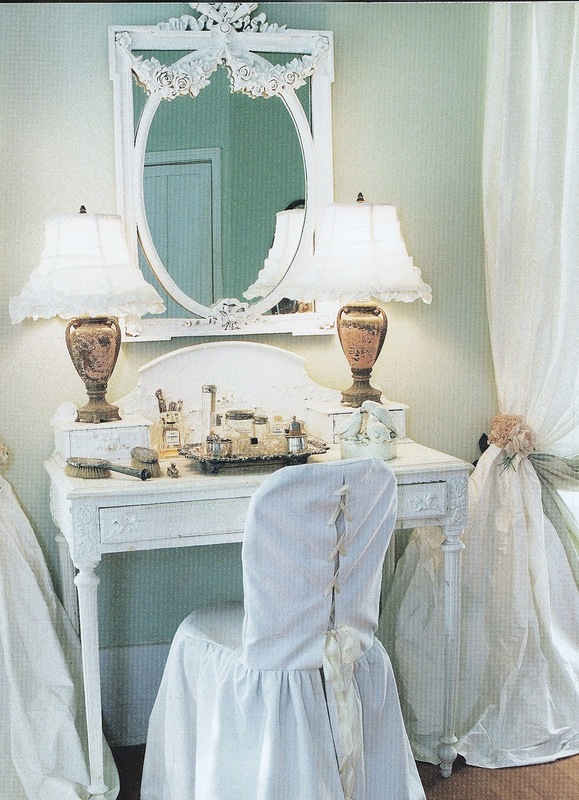 I love nothing better than settling in with a beautiful decorating book. Thanks for offering the chance to win and happy 3rd year of blogging! Looks Yummy! How happy for her! Of course I follow,,,,,,happy blogaversary my dear friend! It's been So much fun getting to know you over the years...I cannot imagine NOT having you in my life,,,,albeit to date, "Virtual!" I've been "following Carolyn" on FB for a while! And you also! I will also post on my Blog Sidebar! Have a great week Debra,,,working once again on my Studio for Karen's Event.......Ackkkk! I have a lot of STUFF! I am a follower of your blog through google and linky.....I would love a chance to win this amazing book. yes, i am a follower, but sorry, i can't "like" you (uh oh, that sounds even weirder)cuz i don't do facebook. thanks so much for the chance to win your giveaway! I'm a faithful follower of your inspiring blog and I'd love to be entered into your giveaway. I have another book by Carolyn Westbrook, and she is truly amazing! Thank you for offering this. For a sweet "second chance", I liked Carolyn Westbrook on her facebook page! Already a fan favorite follower! I would adore Carolyn's new book. Her first is a big favourite of mine.....kind of like my Bible. Debra, This looks like a beautiful book and one I would love to own! Of course I am a follower. Debra, I Liked Carolyn on FB. I'm a follower. Looks like a lovely book. 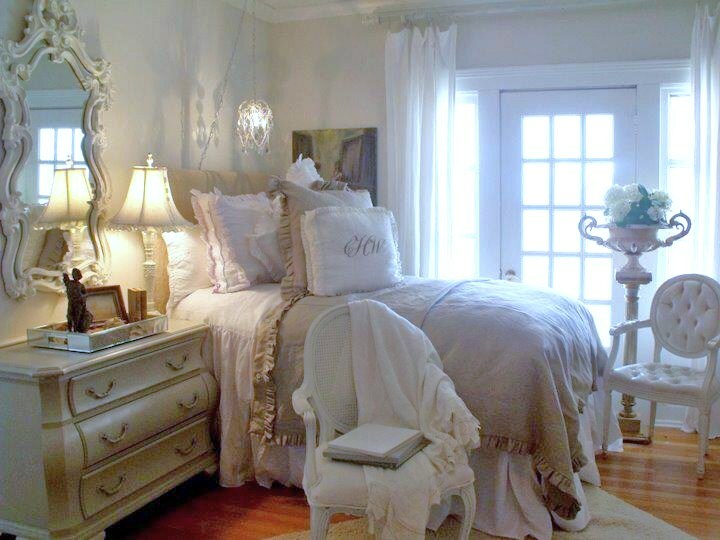 I just adore romantic style decorating. I follow you and would love a chance to win the book. I follow via GFC! Thanks for the chance! What a beautiful book! sent a friend request to Carolyn on Facebook! Hoping to be friends on facebook too! I sent a request, thanks again for the chance at this great giveaway! i am a follower and thanks for the chance at this great giveaway! Visited Carolyn Westbrook on Facebook and "Like" her there. I posted your give away picture on my Blog Sidebar! I am a follower--this book looks fantastic! Added Caroline Westbrook on facebook as well. Hi Debra, just shared Through The French Door on my facebook page - Vintage French Time Worn Treasures. The book looks wonderful, but I really want to say Happy Anniversary! for you & your blog. I Cheers to many more years of fun! Debra, I'm a fan of Carolyn's and have shopped her Round Top booth many times. Love her style. I'd be thrilled to have a copy of her new book. I appreciate the heads up about its publication and also the chance to win a copy here. Congratulations on your Blog Anniversary. Yes, I am definitely a follower, Debra. Keep up the wonderful work you do on this blog. I am following you on this site. Receiving your latest blog entry in my email is one of the highlights of my day. I would love to have the book. I have sent a Friends request to Carolyn on facebook. I did not see a button to "like" her on facebook. I would love to have the book. I am sharing your blog on my facebook page. I would love to have the book. Congratulations on three years of wonderfulness! I'm already a follower. What a fun giveaway! Already a follower of yours of course! No facebook darn it. Trying to stick to my guns on that. It is hard though. Anyways I posted on my blog this awesome giveaway! Thanks again.. I went to Carolyn's Facebook and put in a friend request. I couldn't find the like button. I need to work more on Facebook too, sometimes it just confuses me! I put this button and your giveaway in my sidebar. I follow you and put in for a friend request from you on facebook too. And, I follow you too! Thanks for this awesome giveaway! Carolyn has my favorite French decor books of all time! Love her! Congrats and thanks for the fun! Definitely a follower! Thanks for the opportunity to win! Also liked carolyn on her Facebook page! I would love to win the new book, it looks amazing. I am a follower on your site and enjoy our 'visit' each day, but I do not do Facebook so I can't do that part. I am already a follower of Common Ground---luv ur blog! I checked Carolyn's FB page and cannot find a LIKE button. Already a follower and would love to be entered! i am a new fan on her book page (wouldn't let me become a personal fan from Fishtail Cottage) :( but i did share the new book w/my friends on fb! Already a follower. The book looks wonderful! I sent your a friend request on Facebook! You know I'm following you Debra! And I'd love to have this book! Now why couldn't I find a "like" button on Carolyn's facebook page---I couldn't, so I sent her a friend request. I also sent a friend request for your facebook page, because the "like" button wasn't appearing for me. I come by enough and visit, I thought I already was a follower! Friend of Carolyn now too. I requested to be a friend of Carolyn on Facebook. How exciting Debra...merci for the chance! It's posted on my sidebar ~ again thanks! Will follow ... stat ... if I'm not already ... which I might. I'm an avid follower of your blog. I thought for the life of me I had entered this awesome giveaway, but looked again and see I did not! I am a follower and would LOVE this book~I think Caroyln's version of the French Home and all things frenchy are very close to my ideas and I loved her first book and would adore her second book! I am a follower of your blog...I also already follow Carolyn's blog~going to find your FB page! 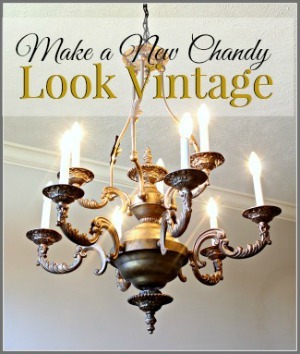 I already am liking you on FB but I shared your giveaway on my Maison Decor blog page on FB! I am so glad that I happened upon your page....I am leaving as a follower of your blog and on my way to finding you on fb. Such a great start to my morning! Love your blog and am entering for the book giveaway! I am now a follower. Count me in as a follower to your blog (1)! Greetings from Almost Heaven, WV! 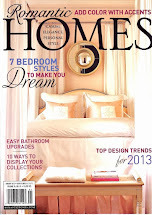 Count #3 for Carolyn's page - I bought "The French Inpsired Home" and love it! Also posted on my FB page for my blog! :) Thanx again Deborah and hope your week is going well! Thanks for the chance Debra! I shared your give away on my facebook. I liked Carolyn on facebook, thanks for the chance to win. I recently visited with Carolyn about her new book, I can't wait to see it but winning it from you would be extra special! You and Carolyn are both on my Facebook page. Happy weekend! I am now a follower and can't believe I wasn't already following you. I love Carolyn Westbrook and have one of her books. I'd never been here before, but was directed here by Twelve-O-Eight and now I'm a follower! Love my necklace! 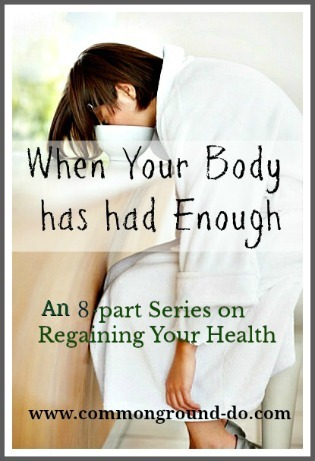 I discovered Carolyn Westbrook some time again and love her books. I am also a follower of yours and get your blog via email. It's such fun to receive it. Great ideas, lovely photos! I follow your blog via email, great giveaway! I'm already a friend of Carolyn's! I've been a follower of yours for a long time, but I just now sent you a friend request on FB! Thanks for the contest--would love to win! I'm already a faithful follower, and sometime-meme-poster, and I sent a friend request. (You may want to consider switching to a Fan Page so we can LIKE you). (: I'd love to have a copy of this wonderful book. Ooh La La! Count me in for this Generous Giveaway... this Book looks Wonderful! I mentioned it on my Facebook page! Great giveaway! Just sent a friend request on Carolyn's facebook page. Hi Debra, the cook looks fantastic! Thanks for offering it. I am happy to already be a follower. I love your blog. I hopped over to fb and liked Carolyn Westbrook. Looks like a very talented lady. I am posting your give away on my sidebar. Thanks again for the chance to win this wonderful book. Hopping over to like you on fb. I'd like you anywhere! I LIKE Carolyn on Face Book! I am sharing this give-away on my blog, Pink Cherub Moon!